It has been in turns a challenging, exciting and rewarding year for the Sports Journalists’ Association. The huge challenges came at the beginning, middle and end of the year and in very different guises. When we called an EGM in October 2013 to simplify the Association’s membership fees structure, we undertook that we would try to make our events much less London-centric. With that in mind we have been helped by two of our sponsors, in BT Sport and Ladbrokes. Our first sortie took us to York last May for a highly successful Race Day organised by Randall Northam. Ladbrokes sponsored the event, which enabled us to offer to our members a full day’s corporate hospitality at one of the country’s top race meetings for a very modest £25. The welcome we received from everyone at the Knavesmire – especially the bookies – was memorable. In fact, the whole event went so well with many northern members joining our throng that we are repeating the event again next month. The “SJA on the Road” theme also saw us stage a Commonwealth Games welcome reception in Glasgow. Mary Fitzhenry, who organises so many of our splendid social events, ensured this was another special occasion for all the domestic and visiting journalists to the Games. We are grateful to BT Sport for their sponsorship of our lunches and an annual set-piece reception at a major sporting event. Last year we were in Glasgow, this year BT Sport will be backing our Rugby World Cup reception. 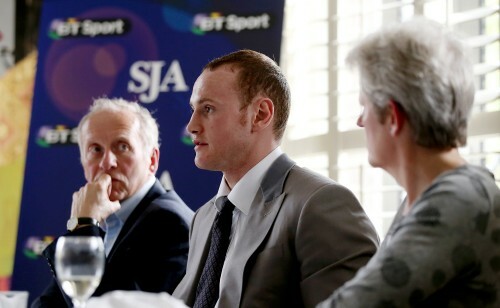 Our lunches have continued with house full signs for the likes of world title boxing contender George Groves. Most recently, we went down the river to Chiswick to stage a special lunch and Q and A with the double Olympic gold medalist rower Andrew Triggs Hodge. It was one evening last May when possibly one of the biggest challenges to the Association’s activities presented itself. It came in the form of the announcement by a company of music producers of an all-star event at the O2, to be staged in November in front of 30,000 paying fans. The problem for us was that, as organisers since 1949 of the British Sports Awards, these other organisers were calling their event… the British Sports Awards. Of course, there have been other sports awards events staged in the past. The BBC has something on each year, we’ve been told. But in this age of global media, and four-year contracts with our sponsors, The National Lottery, your Association’s longest running event was under serious threat. After many time-consuming phone calls and emails with our lawyers, about six weeks later our Secretary, Steven Downes, was able to announce that the rival British Sports Awards would now no longer be taking place, and that your Association had just received a five-figure sum in compensation – money which was soon spent paying to register the Association’s titles, just in case anyone else should decide to attempt to “borrow” one of our events again. Another major challenge was to continue the review of our SJA Sports Journalism Awards. For several years your committee have accepted this event required root and branch surgery. We are indebted to the work that Tom Clarke, Brendan Monks and Philip Barker – who co-ordinated and chaired our judges – have done to overhaul all aspects of the awards including the prizes for journalists, photographers as well as television and radio broadcasters and production teams. It has been a huge task and one we accept needs further work. 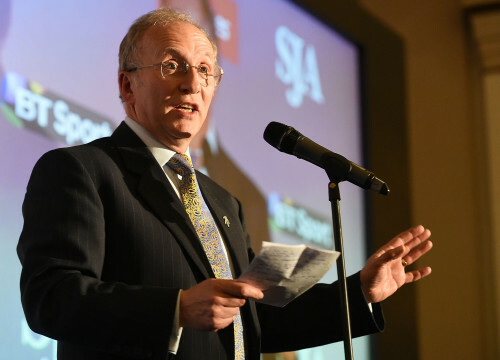 But I’m sure everyone who attended the SJA Sports Journalism Awards in March will acknowledge we are making definite progress in confirming our event as the Oscars of sports media. And our final challenge may well have been our biggest. We have known for some time that, after a distinguished decade, Sir Michael Parkinson intended to stand down as our President. I cannot stress enough the quiet, effective insight he has brought to that role. Sadly, because of Lady Mary’s ill health, he could not be with us for our March awards. At a future date, we will honour the contribution Sir Michael has made to the SJA. He has been a passionate and eloquent figurehead for all that is best about British sports media. So the next challenge was how we could find a worthy successor to Sir Michael. It’s fair to say that over months we reflected on the situation, and discussed it with the retiring President and long-serving members of the SJA. One man emerged as our unanimous choice and we will be putting his nomination to the AGM for formal ratification. He is Patrick Collins, until his recent retirement, the Mail on Sunday’s Chief Sports Writer. Patrick has been our Sports Writer of the Year on five occasions, across three decades. Significantly, beyond being an outstanding writer he is also one of the most respected members of our trade. A man friends and younger colleagues have turned to for advice and guidance. His sagacity will be an important part of the contribution he can make as our next President. I mentioned exciting elements to the work we’ve done and perhaps the epitome of this was our 2014 Sports Awards, staged last December at the Grand Connaught Rooms. By common consent this was one of the best awards events we have ever staged. For this we must extend our thanks to our headline sponsors, The National Lottery. Unfortunately, Rory McIlroy, our 65th Sportsman of the Year, couldn’t be with us but the room was packed with sports stars from an array of disciplines who wanted to be part of our event. It was heart-warming to see an Olympic legend like Sir Chris Hoy visibly moved to be receiving the President’s award from Sir Michael Parkinson. 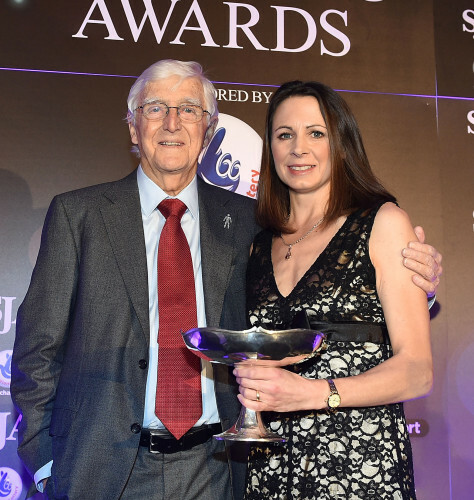 Jo Pavey, our Sports Woman of the Year, was stunned by her success. We could not have wished to honour a more deserving, inspirational and grounded human being. We also were the first people to hand an award to the people who made the BBC play Marvellous one of the television highlights of 2014. You may have noticed that in the wake of receiving the SJA Chairman’s Award Peter Bowker, the script writer, won the prize at the Royal Television Society for best drama. Marvellous is also short-listed for three BAFTAS next month. It’s good to know that where the SJA leads, the luvvies will follow. Nobody in attendance at our event will forget the sight of Neil Baldwin, Lou Macari and Peter Bowker collecting their trophies. Your committee will not become complacent. It has been rewarding to receive widespread backing for the work of the SJA. Some of it is very public, such as staging major events, but there are other issues being dealt with quietly and efficiently behind the scenes, often directly with sports governing bodies. I must thank the members of your General Committee for their support, insight and guidance over the past 12 months. I know they won’t mind me citing for special mention the work of our secretary Steven Downes and treasurer Sarah Juggins. Sarah has displayed great tenacity to sort out some of the haphazard hurdles and complications created by our banking system and the demands now placed upon us of being registered as a limited company, at the request of one of our sponsors. Now she has everything under control. And Steven works tirelessly to cover an array of tasks beyond the secretariat. We are indebted to him for his efforts as our website editor and king of the Twittersphere. This is the end of my second year in office. I hope you agree that the SJA is moving forward as a professional organisation representing the work and wishes of the British media. We will continue to be progressive and always welcome the input from members of our Association – old and young.